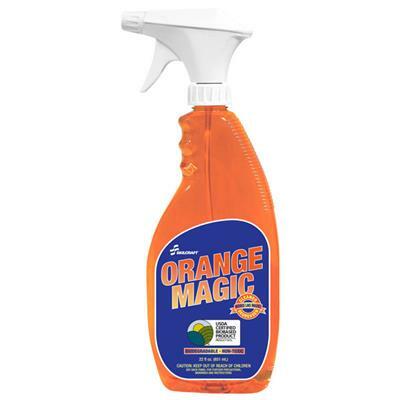 Orange Magicis an effective, multi-purpose cleaner formulated to cut through tough stains and greasy residues. Orange Magic quickly penetrates and dissolves grease, oil, dirt and grime from metal, concrete, plastic and wood. The natural cleaning power of orange oil combined with potent, biobaseed cleaning agents work like magic as difficult stains disappear. Simply spray Orange Magic directly on the stain, allow several minutes for the solution to penetrate, and then rinse with water. This tough cleaner is safe to use on painted surfaces and as a pre-treatment for fabric.